I did meet Terry Tussey yesterday. We drove to his shop in Carson City, NV and had the pleasure of meeting a very talented man. Terry is an artist with the 1911. I saw and got to play with the most recent gun he is making for Steven Seagal (#19). It is a Caspian based gun but the tricks Terry has done to it are beyond comprehension. I can only liken my experience with Terry to watching a great artist paint. About one and one-half years ago, Terry was injured riding his mountain bike at Lake Tahoe. He is now a paraplegic and confined to a motorized wheelchair. His pride and spirit have brought him back to work after a year in the hospital. I saw Terry’s pictures with Seagal and other celebs, but he is a down-to-earth man with incredible talent. When I was a youngster, I used to sit and watch Bob Chow do almost exactly what I witnessed yesterday. 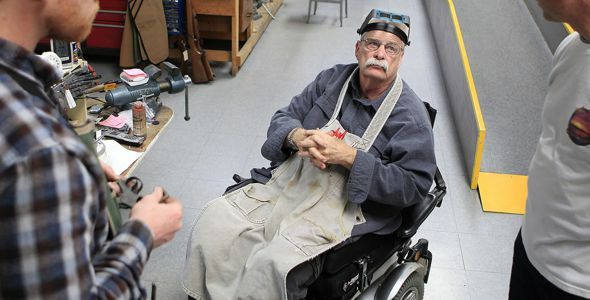 When Terry stripped my 1911 and began working his magic with a Dremel, sear block and decades of talent, I was transported back forty years to Bob Chow’s shop in the Mission District in San Francisco. Not only did Terry produce a perfect carry trigger in my Kimber in about ten minutes, he let me handle multiple custom guns he has made which are truly works of art. He can actually produce a trigger on a 1911 Series 80 that breaks at 2.5lbs, but will not fall when the slide is released. For those who know a lot more about the mechanics than me, I guess that is pretty amazing. His variations of internal compensators and other custom items are astonishing to say the least. Maybe Armand Swenson was a lot like Terry, but I wouldn’t know. So, Terry is rebuilding his life as a wheelchair-bound paraplegic. I stayed with him for about three hours, and he was incredibly gracious to let me watch him do my trigger job. We talked a lot, and I felt like a lucky soul when I left to have had the privilege of watching an artist work who never showed a hint of ego. I saw guns that few can dream of. Terry is planning to semi-retire next summer. He intends to convert to a subscription-based concept where he will build twelve guns a year and that is it. For now, he is active for as long as he can take it (about six hours a day), but it is obvious that he wants to move into a different world more suited to his limitations. So, there is my range report. I can tell you that I have a perfect 1911 trigger for combat carry (3.5 – 4lbs.) in my Kimber. I can tell you that Terry is a master gunsmith by my observation and prior knowledge. I don’t know how many of his kind are left on this earth, or how many are following in the footsteps of the masters, but I do feel blessed for what I was allowed to observe and assimilate this weekend. 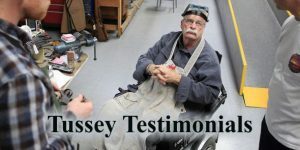 Tussey Custom Guns is his shop’s name, and I plan to send him a few more to work on while he is still willing and able. Pardon the ramble, but it is hard to describe greatness of the kind I just witnessed from a man in a wheelchair in Nevada.